Item shown above : Mahogany Finish with a semi-gloss lacquer. (golf balls sold separately). Two words: "Unmatched quality!" 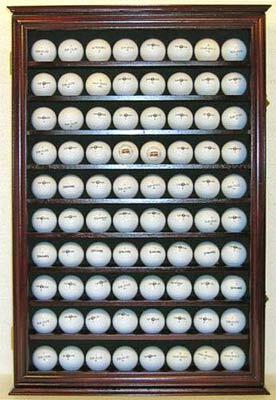 This golf ball display case would be great way to display memorable shots, club championships/tournaments, or autograph balls. This would also make a great gift for golf-lovers. Felt background (dark green color) to create a lovely display. Dimples on the shelves to secure the balls. Super fine smooth surface. Brass hinges, door latches, and wall brackets to hang. UV protection acrylic door to protect from dust and damage.